Before getting dinner ready tonight, I saw this recipe for Indian Naan Bread and thought I would give it a try. (click here for the recipe) I've only had Naan once before and it was delicious, so I had high hopes that we would be in for a treat tonight. What I didn't anticipate was my baking stone! With it being in such a hot oven for so long, the heat made all the oils that has been seeping into it over the years rise to the surface and pool up in a thin layer of grease on the top! I had to wipe it clean with a paper towel before I would put the bread on to bake. And every time I would open the oven door, my fire alarm would go off! So that was a bit of a detraction from the whole experience, but it tasted really good and the kids loved it! My baby ate almost a whole piece herself! The dough was very soft and tender, kind of like those large soft pretzels. If I make this again, though, I'll try to find my other stone that hopefully isn't so seasoned! We celebrated my son's 4th birthday today with his friends, and he wanted a "green truck cake," so I came up with this idea: I made the road out of crushed Oreo cookies and made little trucks out of snickers (fun-sized and bite-sized). The wheels were Whoppers cut in half, and the head lights and tail lights were mini m&m's. While it's not the fanciest cake ever, I had a lot of fun designing it and putting it together, and the kids at the party loved it too! Happy Birthday Isaac! 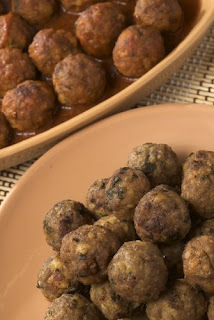 I heard about a segment on Studio 5 last week all about meatballs and creative ways to cook them, so I printed out the recipes and will be trying one of them out tomorrow, haven't decided which one yet. I'll let you know which one wins and how fabulous it tastes! And I'll be sure to take pictures! Click here to see the article and recipes. Mix with a wooden spoon, then knead to blend well. Store left over putty in fridge covered with plastic wrap. 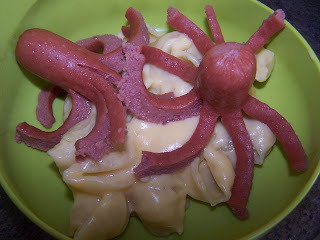 This is such a fun and easy lunch to make for your kids, and it looks so cute, they'll love it! Take a hot dog and cut it in half. Then take a sharp knife and cut up the length of the hot dog, leaving about an in at the rounded end for the head. Keep rotating and cutting until you have 8 legs. Boil water in a medium saucepan and drop the cut octopuses into the boiling water and cook until hot. Serve over shells and cheese! Prepare about 1/2 lb. shells pasta according to directions. While the noodles are cooking, prepare the cheese sauce in a medium saucepan by melting 2 tbls. butter over medium heat. Add 2 tablespoons of flour and mix until completely blended. Pour in 1 cup of milk and stir well. Keep stirring until thickened, then add 1 cup of shredded cheese. Season with salt and pepper to taste. Add cooked pasta and stir until pasta is coated, and serve. Enjoy! Add milk, soup, onion and bell pepper. Mix well. Add cheese and bake another 10 minutes or until bubbly. Bake frozen casserole at 350 degrees for about 1 hour. 1. Preheat oven to 325 degrees. Grease two 8x4 inch loaf pans. 2. Mix the flour, sugar, baking soda, baking powder, and salt. Add the eggs, sour cream, and raisins and mix until just combined. Distribute batter evenly between the two pans. 3. Bake loaves for 1 hour.